As the AFL community celebrated Multicultural Round, Collingwood Media caught up with former Magpie Marty Clarke. 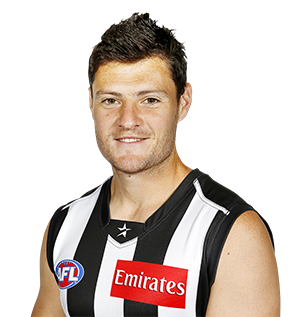 Retired Collingwood defender Marty Clarke has revealed he was diagnosed with a rare energy-sapping disease as he fought to save his AFL career in the second half of 2014. In the lead up to the 2014 National Draft, take a look back to the draft that helped shape the 2010 premiership. The likeable Irishman started his second season back at the club on the right note, playing all four of Collingwood’s NAB Cup games and then the first seven senior games of the season. He looked like he was getting back to his best when he had 22 disposals in the win over Carlton in round two and then a career-high six clearances against Richmond a fortnight later. Clarke’s season hit a speed hump when he was subbed out of the round seven loss to Fremantle with a corked thigh. He returned a fortnight later and received a last minute reprieve against Brisbane when he was an eleventh hour replacement for an ill Travis Cloke. Despite winning 17 possessions, Clarke was omitted the following week and did not feature at senior level again. He played six games in the VFL, starring in the gutsy win over Box Hill with 33 possessions and 12 marks. An ankle injury against Williamstown in round 16 forced him off the field and into hospital where he underwent surgery to repair damaged ligaments. He is expected to be fit for the beginning of the 2014 pre-season. The Irishman added 17 games last season to the 46 he played before taking a two-year break from the game. In the first season of a three-year contract, he had to adapt to the way the game had changed in his time away and did some good jobs for the team, including an impressive shutdown role against Essendon’s Brent Stanton on ANZAC Day. Fell out of form towards the end of the year but is a renowned hard worker and should improve in 2013. Continued to play for Down, but after a series of discussions with new Collingwood coach Nathan Buckley, Clarke decided to return to the Magpies for the 2012 season. Talk in the newspapers had Carlton sniffing around in an attempt to list him, but Clarke stayed loyal to Collingwood and was pre-listed and then traded by Greater Western Sydney (along with Jamie Elliott and pick No. 67) for selection No. 25. Returned to County Down and regained touch halfway through the year after a slow start. His team reached the All-Ireland final with Cork. Down lost by one point. Began well, with 20 touches and two goals in the round one loss to the Crows at the MCG. Had 26 disposals in the win over Brisbane in round four, but from then on his returns began to diminish and his impact on the game began to fade. His final game for the year was in round 12 against Sydney where he began his career two years prior. He had only seven possessions and was omitted the following week. He was granted leave to Ireland for a week to celebrate his sister’s wedding. Although he battled hard in the VFL, and was named as an emergency in four matches, Clarke decided to quit the club and return to Ireland for 2010. Made a slow start to his second season. Found only eight possessions in round one meaning he was confined to the VFL for the next fortnight. Steadily found form and by mid-year was playing consistent football. His season highlight was his performance against Geelong in round nine, when he gathered 28 possessions, laid three tackles and kicked a long goal on the run to break Geelong’s spirits. Was regularly winning over 20 disposals as he ran into September and produced on the big stage, gathering 20 possessions and goaling in the come-from-behind win over Adelaide in the elimination final. Hit the scoreboard again but was quieter against St Kilda seven days later. Having never played Australian Football, Clarke was expected to make slow progress in his first season. Instead, he blew all expectations out of the water with a superb debut season that shocked the competition. He made steady progress for Williamstown in the VFL playing in the back pocket, prompting a promotion to the senior team for the trip to Sydney in round 12. He again surprised, winning 20 disposals in defence and laying four tackles. He proved it was no fluke against Hawthorn at a packed Docklands Stadium the following week when he had 19 possessions and kicked three goals in a pressure-cooker atmosphere. He earned an AFL Rising Star nomination for his work, and continued to make progress as the year progressed playing mainly at half back and occasionally in the centre. Clarke excelled in September, contributing to wins over Sydney and West Coast before being named as one of the best on the ground in the unforgettable preliminary final loss to Geelong (21 disposals, four marks). He had entrenched himself in the senior side by year’s end, with his long left foot and ability to break the lines when running from defence meaning that he represented a unique prospect at only 19 years of age. 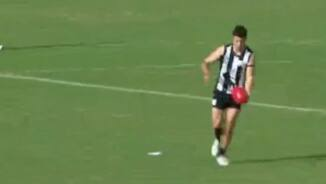 Trialled with Collingwood late in the season, blowing the coaching staff away with his fitness and dedication. His work prompted assistant coach Guy McKenna to label him ‘the Irish Nathan Buckley’. The 19-year-old Clarke agreed to sign with the Pies, and was drafted to Collingwood with selection No. 40 in the Rookie Draft.